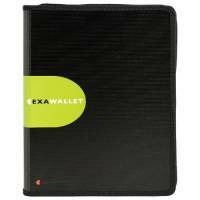 Monolith Meeting Folder Zipped Black 2827 Pack of 1 Monolith Meeting Folder Zipped Black 2827. Leather look 4-ring binder. A4 pad slot and internal calculator. Gusseted internal pocket. 2 multifunctional open pockets. Business card holders. Dimensions: W275 x H345 x D25mm. 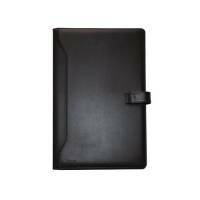 Monolith Black Leather-Look Zipped A4 Folio Case 2754 Pack of 1 "Monolith PU Zipped Folio with Ring Binder, Organiser and Pockets Section. 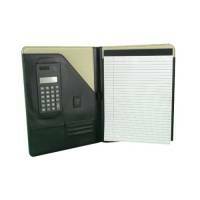 Central 4 ring binder, A4 pad slot and three sided zip opening. Size 370x40x270mm. Black." Monolith Leather-Look PU Conference Folder With A4 Pad Black 2900 Pack of 1 "Monolith PU Conference Folder. Manufactured in soft to the touch leather look PU material with a front popper closure. 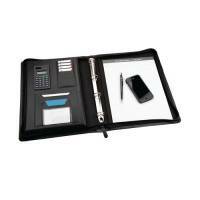 Features include a pen holder, A4 pad slot and pad and three sections for documents. W260xD20xH340mm. Colour - Black." Monolith Conference Folder With A4 Pad and Calculator Black 2914 Pack of 1 "Monolith A4 Conference Folder and Calculator. Manufactured from soft leather-look material, this stylish folder features an A4 pad, expandable document holder, two open pockets, business card slots and pen holders. Colour - Black." 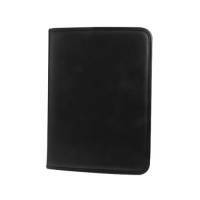 Monolith Conference Folder Zipped Leather A4 Black 2924 Pack of 1 "Monolith Executive Leather Zipped Folio Ring Binder. 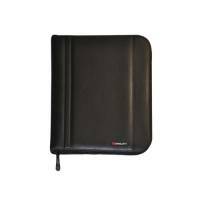 Executive bonded leather zipped folio with suede lining, a 4-ring binder mechanism and internal pockets for documents, CDs and business cards. W300 x D50 x H363mm. Colour - Black." 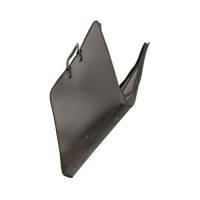 Monolith Conference Folder With Pad Clip A4 Black 2926 Pack of 1 "Monolith Zippered ring binder with Pad Clip. Conference folder with a four ring binder suitable for A4 size paper, A4 pad clip holder, internal organiser with a zippered section, business card holders and pen holder. Colour - Black." 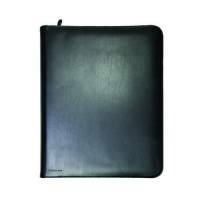 Monolith Black Executive Conference Folder With A4 Pad 2925 Pack of 1 "Monolith Leather Conference Holder. Executive bonded leather conference folder with internal document and card pockets, a calculator, pad slot, pen holder and quality suede lining. W240 x D17 x H320mm. Colour - Black." 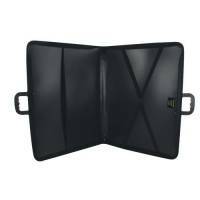 Goldline A1 Zip Portfolio Black ZPC/A1 Pack of 1 "Zip portfolio for the safe storage and protection of work. Features strong nylon zip and carry handles, and feet on the base for added protection. A1." 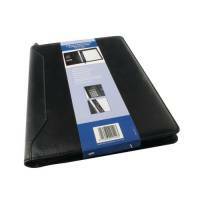 Goldline A3 Zip Portfolio Black ZPC/A3 Pack of 1 "Zip portfolio for the safe storage and protection of work. Features strong nylon zip and carry handles, and feet on the base for added protection. A3."